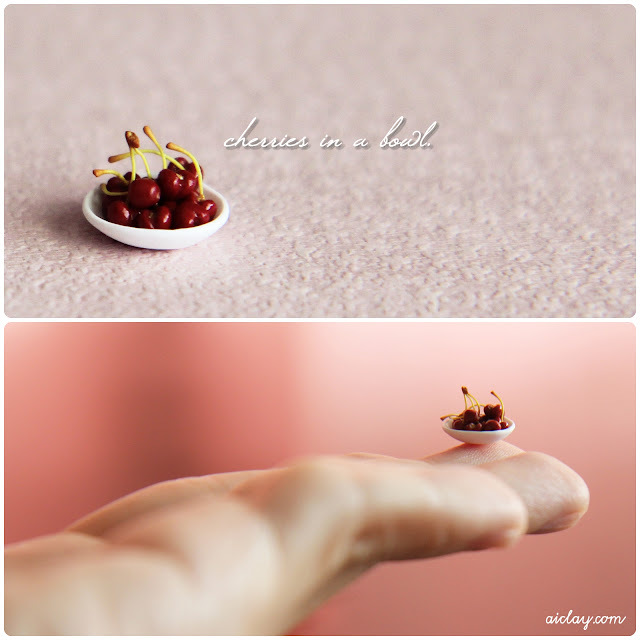 AiClay - a Haven of Miniature Food: a little guessing game. I played a little game with my facebook and flickr friends that day. I posted the photo below, and asked them to guess what it is. The hint I gave them was that it's a part of something else. Very vague I know, but previous experience told me that my fb/flickr friends are fabulous guessers. Here's 1 minute for you, before you scroll downwards for the answer okay? Time's up! Sorry to have wasted 1 minute of your life haha. But did you guess correctly, it's a 1/12th scale cherry stalk! Alright so the stalk is almost hidden by my fat fingers here, the second picture shall show off the stalks better. I also sculpted the tiny white bowl, as I was getting irritated with the mass-made bowls and plates looking all out of scale in photos. All of the cherries are in 1/12th scale, handsculpted by me. Love the cherries, so delicate! The bowl is also very nice. Have fun tonight at the play. The cherry are a great work. Beautiful.